Counter communication systems are ideal for communicating with the public, while maintaing a secure environment on the other side of a glass window. Ideal for cinema theatres, toll plazas, Embassies and other such areas. Microphone Element: Electret Condenser In Both The Units. - Two way counter communication system. - Ticket counters at places like. 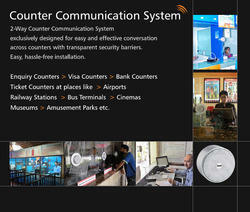 Owing to the presence of our expert team members, we are able to offer a wide range of Counter Communication System. - Unique design, pleasing aesthetics & rugged construction. - AHUJA Two-way counter communication system, exclusively designed for easy and effective conversation across counters with transparent security barriers. It consists of an attendant unit and a customer unit, which are easy to install and simple to connect through a flat 2 core shielded cable supplied with the system. 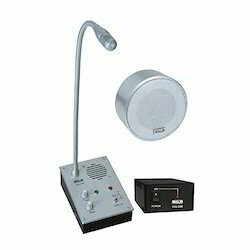 We offer 30 Watts three way system.These consists of counter display and a remote controller for better operation. Moreover, wireless communication is possible using these sophisticated systems.